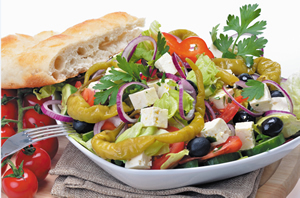 We often write in these pages that the Mediterranean diet is good for your heart and brain. Now it appears that the Mediterranean diet may also help protect your telomeres, according to a Harvard study published in the Dec. 2, 2014, BMJ. Telomeres sit at the ends of your chromosomes and help protect the ends from fraying. Telomere length is considered to be a biomarker of aging: shorter telomeres are associated with a lower life expectancy and higher rates of developing chronic diseases. After analyzing the detailed food questionnaires and telomere measurements of more than 4,600 women, Harvard researchers concluded that a greater adherence to the Mediterranean diet was associated with longer telomeres, and that even small changes in diet made a difference. The Mediterranean diet is rich in olive oil, fruits, vegetables, nuts, and fish; minimizes red meats and processed meats; and includes a moderate amount of cheese and wine.